Filter/Cafetiere: Instantly orange upfront with a milk chocolate body & maple finish. Espresso: Wonderful orange sweetness, with a sugary maple body & milk chocolate finish. 19 grams of coffee to 380 millilitres of water. Temp of Water 93 degrees. Aroma Notes: Orange with subtle hints of milk chocolate. Tasting Notes: Instantly orange upfront with a milk chocolate body & maple finish. Tactile Note: Sweet, velvety and luxurious would go great with all butter biscuits or after spicy foods. 18 grams of coffee to 36 millilitres of water. Temp of Water 94 degrees. Aroma Notes: Milk Chocolate with hints of caramelised sugar. 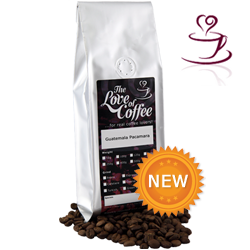 Tasting Notes: Wonderful orange sweetness, with a sugary maple body & milk chocolate finish. Tactile Notes: Rich, sweet and warming would be great served with lunch or after dinner. Huehuetenango is one of Guatemala’s three non-volcanic regions, as well as its highest and driest under cultivation, making it one of the best for coffee production. Currents of hot air sweep up from the Plains of Tehuantepec, in Oaxaca, Mexico, and mix here with the cool air descending from the Cuchumatanes Mountains, creating a microclimate that’s protected from frost and allowing coffee to be cultivated at up to 2,000 meters. Huehuetenango’s extreme remoteness requires that nearly all producers process their own coffee. Fortunately, the region has abundant rivers and streams, making it relatively easy for producers to set up mills. Still more fortunately, Huehue’s geographic conditions help to create exceptional coffees with a distinct acidity and fruity flavors. SHB (Strictly Hard Bean) specifies that the coffee was grown at an altitude above 1,350 meters. (This term is also synonymous with SHG/Strictly High Grown, a classification that’s higher than HB.) EP (European Preparation) means that the green coffee was sorted by hand to remove any defective beans and foreign material.